One of the most fun things about my house, is discovering the things that are coming up in the garden. This is my first spring here, so there are a number of surprises. One of my favorite things thus far, has been the two huge rhubarb plants in the back yard. I have no idea how old they are, and if they have a story (I’m sure they do, but it isn’t mine) and I’ve spent the last few weeks, harvesting, and prepping the rhubarb for some delicious thing. 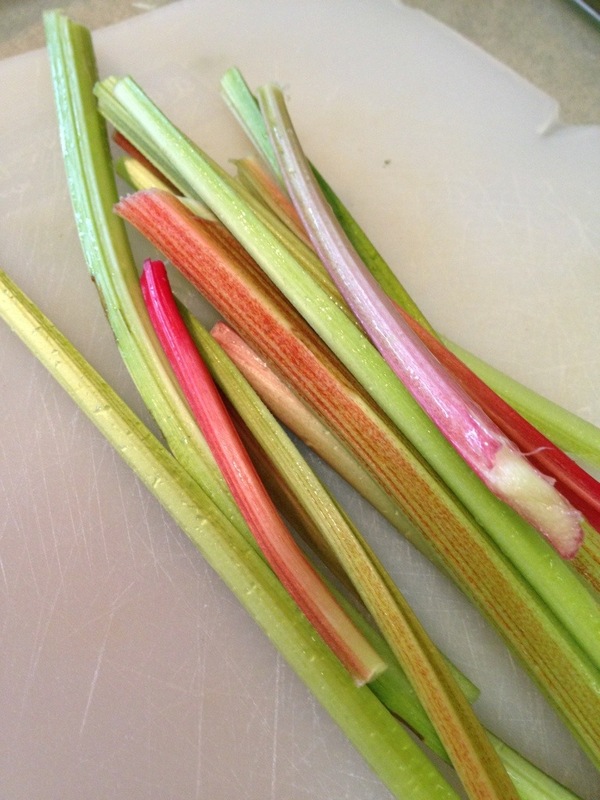 It isn’t the “best” rhubarb in the world, the stalks are a little gangly and woody, and they are mostly green-ish, but I still managed to get quite a harvest, and have put quite a bit in the freezer for future jams, bread, and pies. Yesterday I was feeling like I needed a domestic project though, and so I wandered out to the garden to see if there was anything interesting to harvest. I ended up picking a handful of rhubarb, and immediately came inside to start on a simple syrup. I wanted to create something fresh, and herbal, and decided that rosemary would pair wonderfully with the tartness of the rhubarb. I tend to lean away from using rosemary in conventional ways, because the flavor can be really overpowering, and generally speaking I think it gets overused… but give me a rosemary pairing that is a little outside of the box, and I’m all over it (rosemary thyme sugar cookies are my favorite things on the planet). 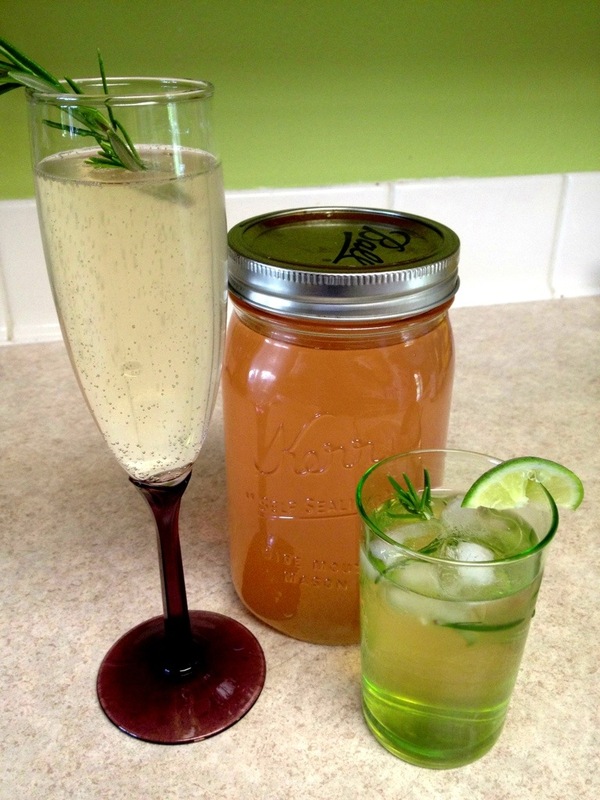 Rhubarb rosemary gin and tonic anyone? My favorite part (or one of my favorite parts) of my new job is playing bar tender, and coming up with new and unusual cocktails that have a fresh market flair to them. The lemon-basil vodka tonics have been a smashing success, and have a permanent home on the menu, and the Cucumber rosemary gin and tonics have had great reviews as well… Now if only the summer weather would stick around. Hello Oregon, we are ready for the refreshing cocktails! As I simmered the rhubarb with sugar, water, rosemary and lemon I started to scheme all the tasty things I could do with the concoction. My immediate thought was of course the gin and tonic (because it sounds delicious, right?) but there was also a bottle of Prosecco in my fridge staring me down, and what better to pair with a bit of bubbles than a wonderfully pink and herbaceous syrup? (I’m actually drinking this right now, hello-wine Wednesday! its fabulous. I don’t usually drink in the middle of the day, but I had to take some photos for this post, and when in Rome/ when it is your weekend you drink the rhubarb rosemary bubbles for lunch). I’m totally obsessed with the blush color of the syrup, something about it just makes me feel very lady like… perfect for brunches, bridal showers, or just a Wednesday afternoon. 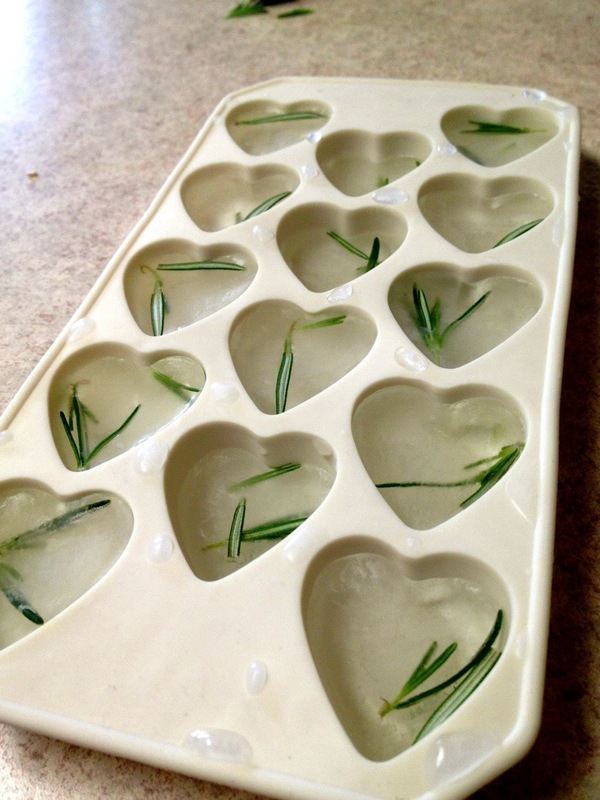 The party-thrower/ hostess in me wanted to add a little more flair to the cocktails, so I froze some rosemary in my ice cubes. It is so simple, and presents amazingly, and can be done with any herb or edible flower. I love adding mint or lavender to ice cubes for lemonade, and borage blossoms and rose petals make a beautiful addition to any punch. 4-5 small sprigs of rosemary. 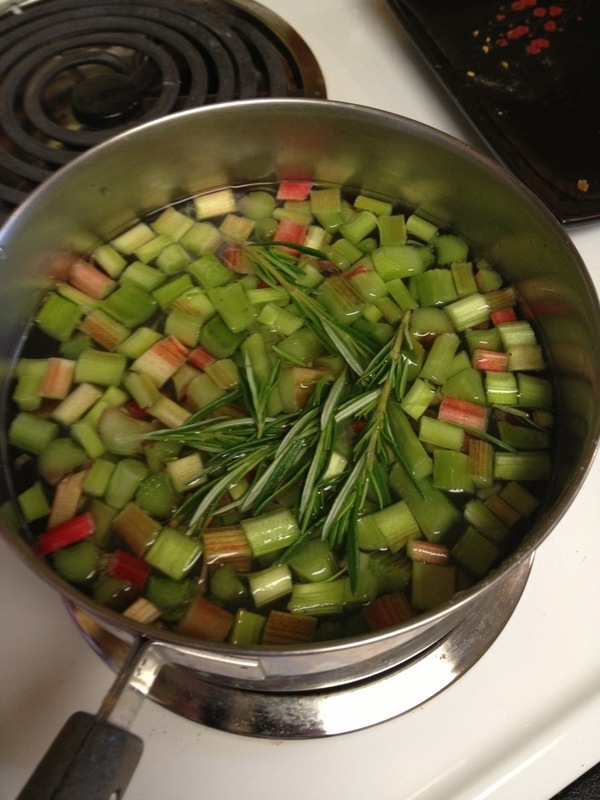 Combine water, sugar, rosemary, rhubarb and lemon juice in a sauce pan. 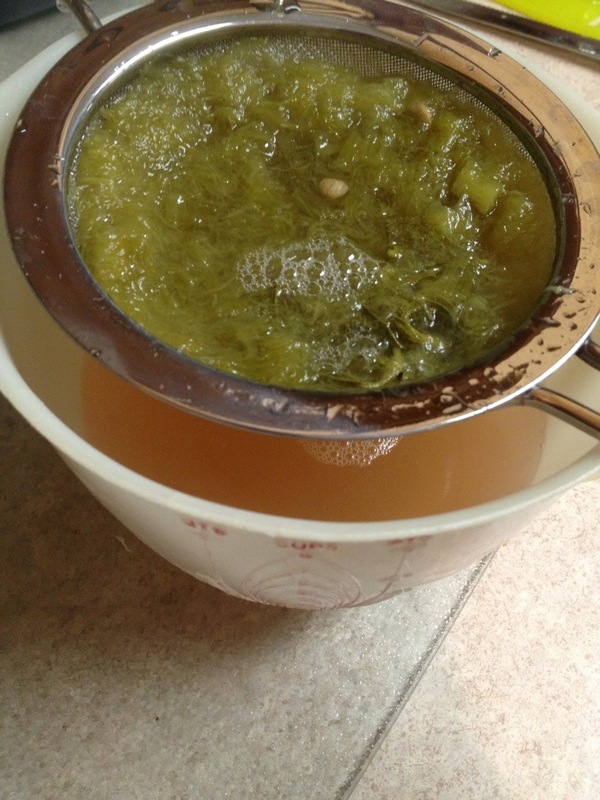 Slowly bring to a boil, and let simmer for 10-15 minutes. Strain out solids and save for some delicious snack. I’d love to see what other delicious ideas people have for this syrup, and highly encourage you to share them here! 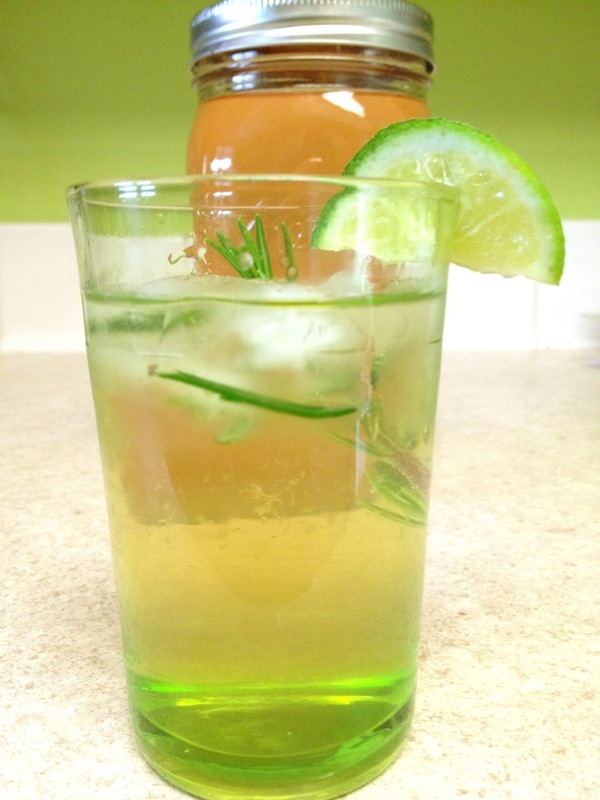 garnish with lime wedge & sprig of rosemary. top off with prosecco & a rosemary garnish.